I've been using tabs on the left rather than the top - see below: Firefox (circled) and Windows TaskBar. I quite like it - it's readable, and it uses the space efficiently (especially when you have a couple dozen tabs open). posted by Jonathan at 10/19/2007 09:02:00 p.m.
No! Tabs are the enemy! Everything I might want to switch to should be an equal citizen as far as Alt-Tab is concerned. 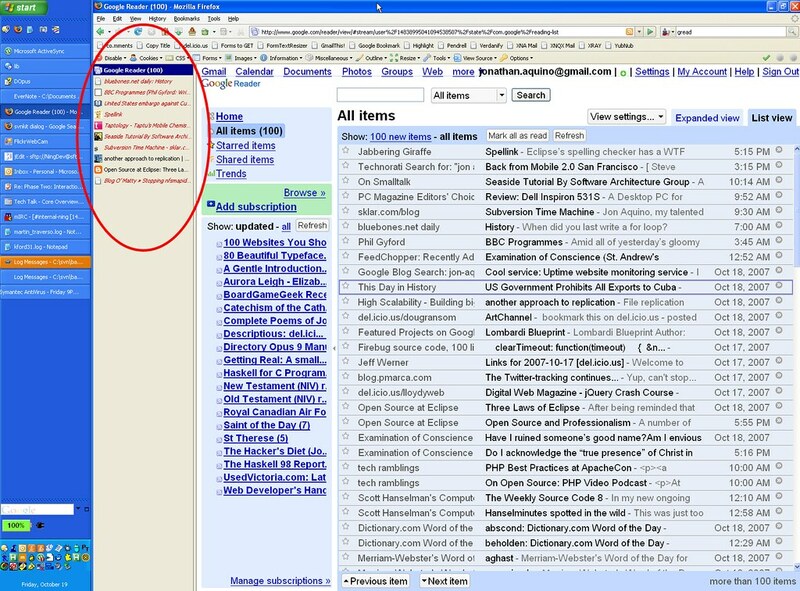 Gmail hidden in the mass of Firefox tabs. No way! By Thomas David Baker, at 10/20/2007 7:41 a.m.
Ah - interesting point, Tom. I was of the same mind once - no tabs but separate windows. And it worked well; I think it got a bit slow on my computer at the time. I should try it again. By Jonathan, at 10/20/2007 9:46 a.m. Thanks for the link - I'm trying it out. By ekbworldwide, at 10/20/2007 11:14 p.m.
Yeah it's a great extension. And it works fine with TabMixPlus! By Jonathan, at 10/21/2007 2:26 p.m.
How do you get your Windows Explorer tab bar to stack vertically like that? I'd like to try it that way, but I can't figure out how to do it. By Anonymous, at 11/04/2007 1:36 p.m.
Hi Anon - Simply drag the taskbar to the left. If you want the tabs ordered alphabetically, you can buy Button Boogie 2 online for about $10. Unfortunately you must manually order the tabs alphabetically, so it's a bit inconvenient. But you only have to do it once (or no more than a few times). By Jonathan, at 11/04/2007 3:56 p.m.